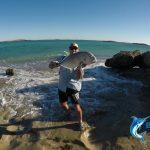 The final charter of our 2018 Abrolhos Islands fishing charter season is already here! 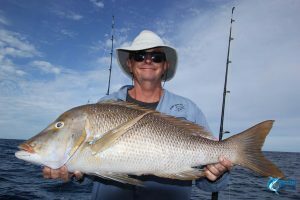 For Captain Chad this was his 17th season at Abrolhos Islands and he has loved showing another great bunch of customers the awesome fishing, stunning landscapes and history of these awesome islands off remote Western Australia. This week we had a group of friends for a 4 day fishing charter, their first with Blue Lightning and their first to the Abrolhos Islands. 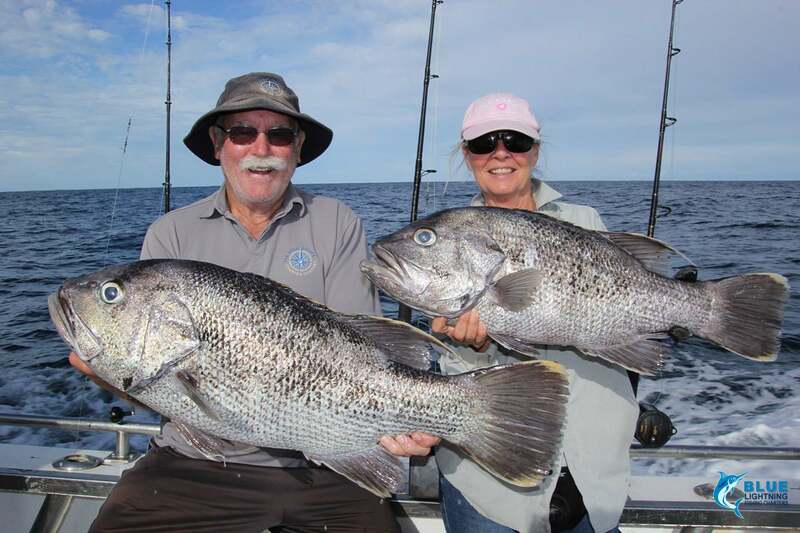 This crew was excited to get fishing so we kicked the charter off trolling our way to the Abrolhos Islands. Damo was first up with a Coral Trout to put a smile on his face. 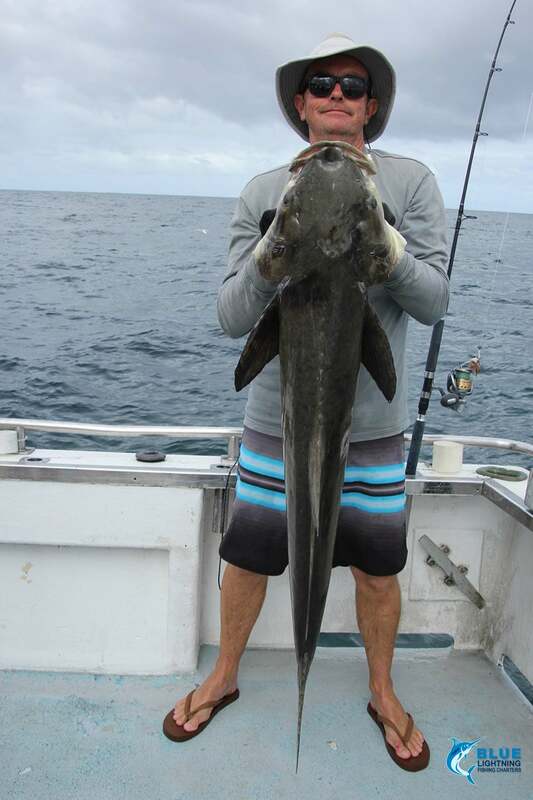 It was time for Captain Chad to showcase one of his many epic fishing spots with the first bottom fishing session of the charter. 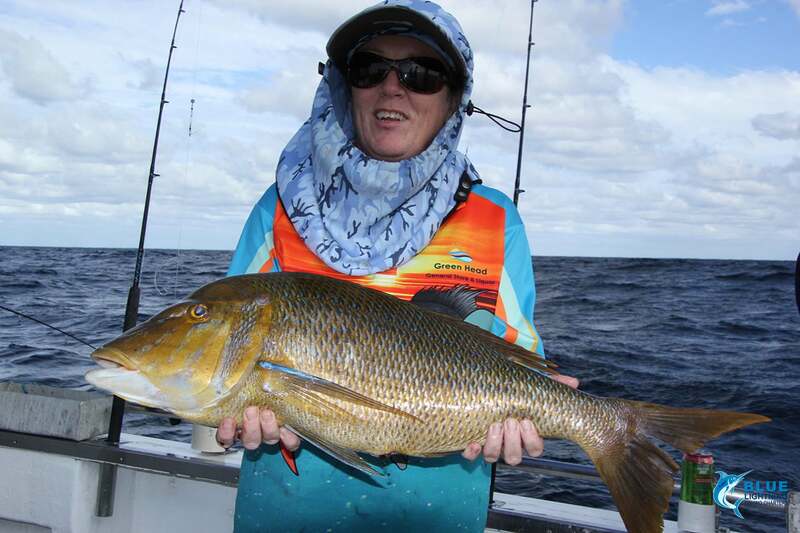 The crew were stoked to catch Red Throat & Baldchin Groper in a fun little session. Lesley topped off the session with her first ever Beak Sea Cod ensuring she was all smiles. 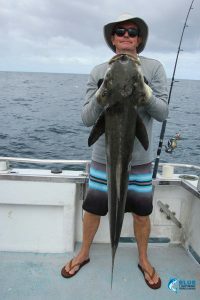 For our next session we decided on some shallow water fishing. The Baldchin Groper were firing, making for a great session for these Abrolhos Islands newbies. After some rough seas in the morning the water had calmed to welcome this crew to the Abrolhos, with some beautiful calm. The crew were keen to try some of the Abrolhos Islands famous Crayfish and we were stoked to be able to provide some awesome Crayfish and Squid to top off an awesome first day. 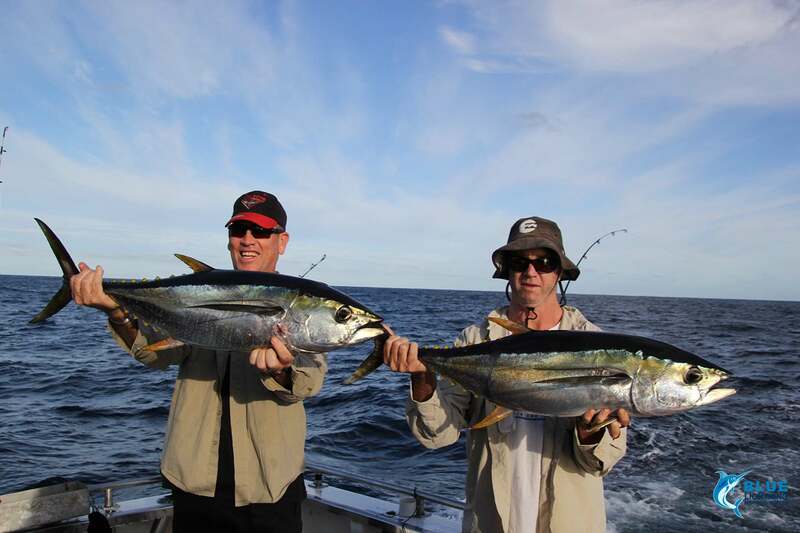 Day two started in a good way with Bruce and Peter both catching a Yellow Fin Tuna each. It was an extra happy catch with both managing to tick Yellow Fin off their fishing bucket list for the very first time. 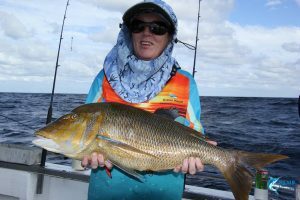 Lesley followed with her first ever Dhu Fish. 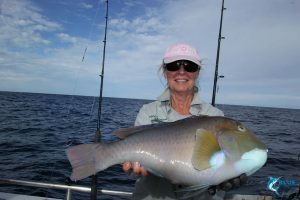 Lesley had said to me at the start of the trip, that she would love to catch a Dhu Fish, so it was extra special to be a part of it and to see her so over the moon. 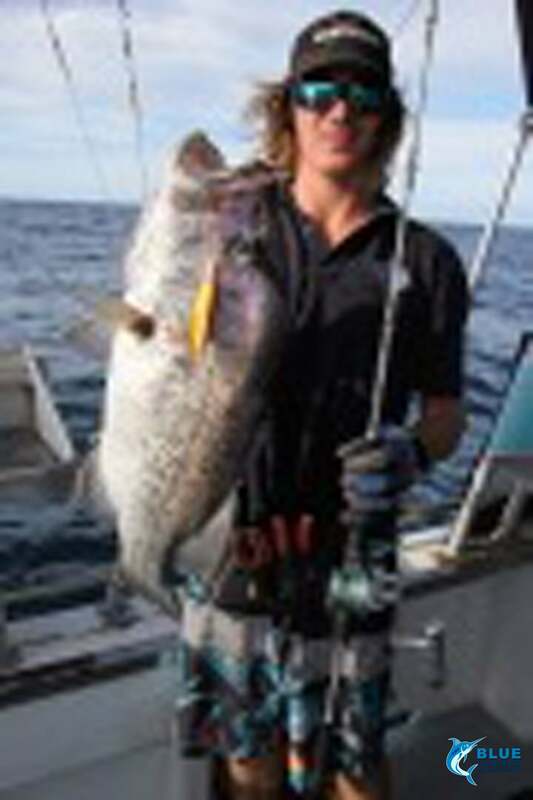 Decky Sam dropped in a line and caught himself a nice Dhu Fish. It was a fun little session for the whole crew but it was time to move on to another bottom fishing spot. Damo managed to score himself a PB Spangled Emperor before John got his personal best Dhu Fish. It was proving to be an awesome day of Abrolhos Islands fishing all around. Craig kicked off the morning of day 3 sharing the love with a practical joke, spraying everyone with ink. He is definitely the record holder for ink sprayed on the boat. After a fun start we decided to get trolling, Amanda was first up scoring herself a Coral Trout, with Roy following with a sweet Spanish Mackerel. Next up it was time to try our hand at shallow water fishing. 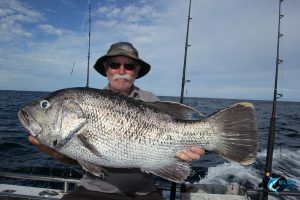 The Baldchin Groper proved very hungry with the crew catching a few. Damo also scored a personal best Cobia, weighing in an impressive 18-20kg range. 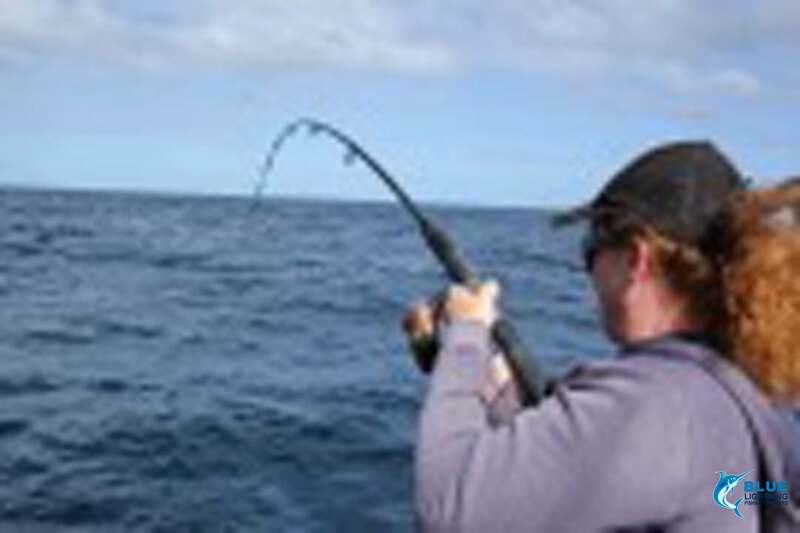 The next session of the day was bottom fishing which proved to be a little quiet. 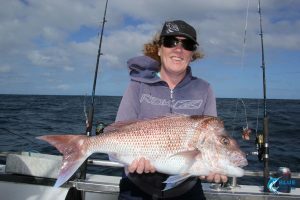 Amanda scored her first Pink Snapper of the charter which was a good size and was Amanda’s personal best. We ended the day with some trolling, where Roy got his personal best Spanish Mackerel, making him one happy angler. 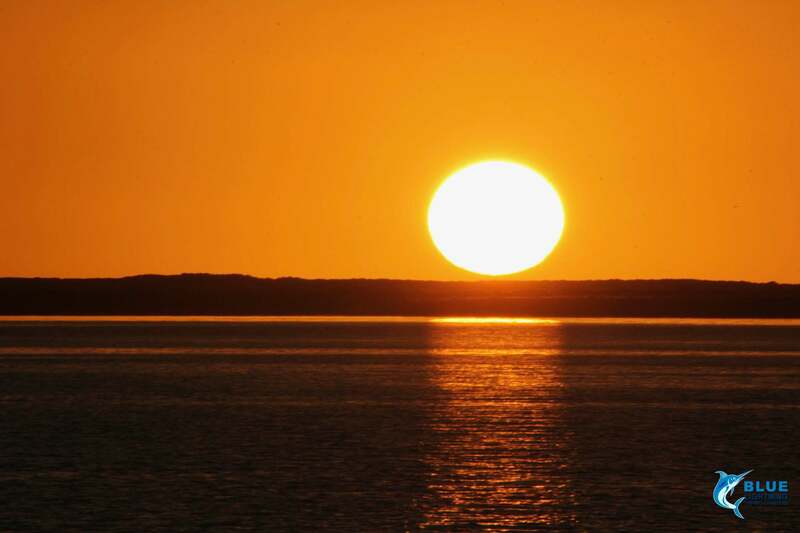 We woke on day 4 to a beautiful day on the water, the Abrolhos Islands were really showcasing their beauty to this crew! We were all a little disappointed that the fish seemed to sleep through it but that’s fishing. 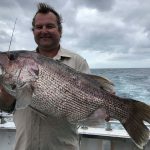 The crew still had a great charter and Captain Chad, Decky Sam & myself were stoked to be able to share the beauty and great fishing of the Abrolhos Islands with this last crew for the season. We would like to thank each and every angler we have welcomed on board Blue Lightning Charters this season for making it yet another memorable season. We love being a part of your fishing experiences here in Western Australia. Sharing in your personal bests, firsts and seeing each of you experience all these beautiful islands have to offer makes our “job” pretty amazing. We already have some great reviews from the season with TripAdvisor awarding us a 2018 Certificate of Excellence! Thanks for all the great reviews, they mean a lot to the whole crew! I was lucky enough to be a late call up for the trip to the Abrolhos Islands which turned out to be an absolutely awesome time. The crew couldn’t of been more accommodating and friendly. I would recommend anyone interested in doing a fishing charter to the island to definitely book through Blue Lightning Fishing Charters given their level of professionalism and customer care. I have done a lot of fishing throughout WA but never been to the Abrolhos. Despite not managing to record any PB’s, I still managed to catch some nice fish and will have some fond memories from the trip. Seeing the joy expressed by Leslie when she caught her first ever Dhuie made me so happy. Even better was when her husband John pulled in one shortly after and they got to get a snap together with their prized catch. Fishing in the shallows where the baldies were thick and there was action a plenty. Visiting Big Pidgeon Island and seeing how the locals lived. Getting to dive in the Sanctuary with schools of big Spangled Emporer, Coral Trout, Surf Parrot Fish and an array of different coloured tropical species. 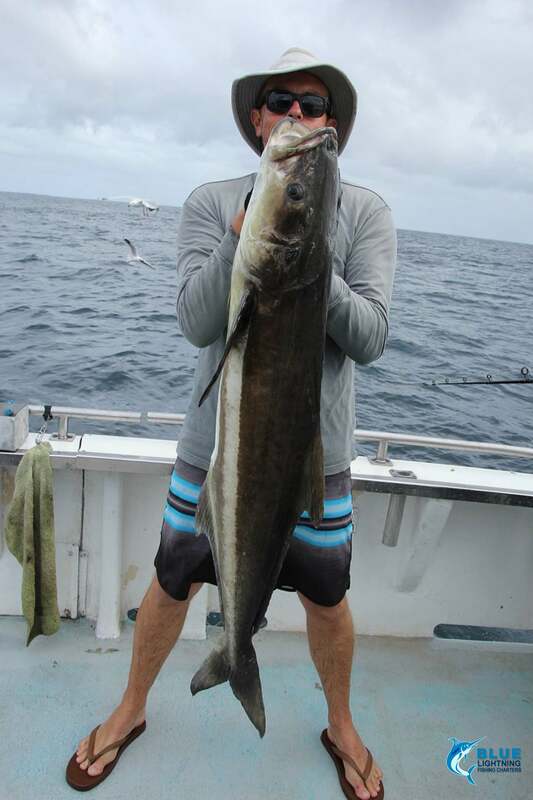 Cracking up when Craig decided to spray everyone including himself with a cuttlefish he caught and Damo hooking up on a massive Cobia which I spotted swimming by only moments earlier. I really enjoyed meeting so many nice people on the trip and it was great to see everyone get on so well. Special thanks to Leah for her culinary skills and making us some wonderful meals. Thanks to Chad our Skipper for happily sharing information on the islands, taking us to some great spots, preparing magnificent sashimi and getting us home safely. Final big thanks to Sam our hard working and sometimes cheeky decky. Great to see so much passion from a young man who clearly enjoys his work.